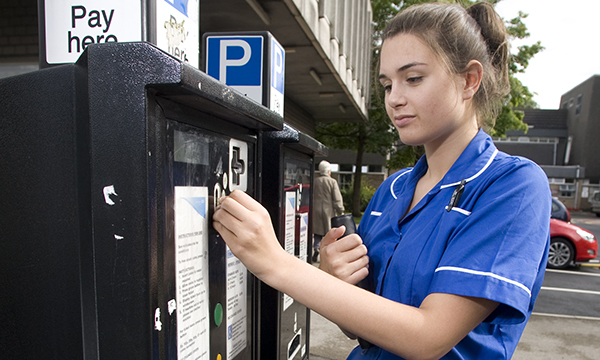 NHS organisations in England charged NHS workers £69.5 million in 2017/18 in fees and fines incurred by parking at its sites, according to NHS Digital. The union Unite, which represents about 100,000 healthcare workers, said the parking charges amounted to a tax on hard-pressed employees. The union's national officer for health Sarah Carpenter said: ‘It is a scandal that NHS trusts in England have pocketed nearly £70 million from staff car parking charges. Ms Carpenter said staff were being used as an extra income stream for financially squeezed trusts. ‘We would like a situation where dedicated NHS staff – who don't earn a fortune – don't have to pay to park their cars to go to work to look after the sick, the vulnerable and the injured 365 days a year,’ she said. Hospital parking charges were abolished in Wales earlier this year after the last contract with a private firm expired, a decade after the Welsh Government announced parking would be free. An NHS Improvement spokesperson said income generated from parking was used to pay the costs of providing parking facilities, while excess funds were put into clinical services. ‘As we develop the long-term plan for the NHS, it is right that trusts continue to develop their commercial income opportunities,’ they said.